This is the second article in a 2-part series on canine cranial cruciate rupture. The first article—Canine Cranial Cruciate Disease: Updating Our Knowledge about Pathogenesis and Diagnosis—was published in the July/August 2013 issue of Today’s Veterinary Practice. Canine cranial cruciate ligament rupture (CrCLR) has long been recognized as a surgical disease. Of large breed dogs with CrCLR, 81% to 100% remain lame unless surgical correction is performed. In small dogs (< 10 kg) and cats, exercise restriction, weight loss, and physical therapy have been recommended for treatment of CrCLR, with reported lameness resolution ranging from 73% to 90%. In my experience, however, lameness often does not completely resolve in animals managed nonsurgically, and they frequently return for corrective surgery after prolonged periods of lameness. In my opinion, surgical correction should be offered at the time of diagnosis for all dogs and for cats. Various extracapsular stabilization procedures, including the TightRope (arthrexvetsystems.com). The goal of TPLO or TTA is to change the biomechanical function of the knee to limit cranial drawer during weight-bearing movement, and TPLO is currently the most commonly recommended procedure by ACVS surgeons for CrCLR therapy in dogs weighing over 60 lb.4 Extracapsular stabilization relies on periarticular fibrosis for long-term stability since no artificial ligament substitute remains intact in vivo over long periods. A number of extracapsular stabilization techniques have been described and result in normal return to athletic function. The intra-articular structures are examined, torn fibers of the cranial cruciate ligament (CCL) are often debrided (although no evidence exists that debridement improves recovery), and any meniscal damage is addressed. The joint is lavaged and the joint capsule closed with monofilament absorbable suture in the continuous or interrupted pattern of the surgeon’s choice. This suture is passed around the lateral fabella and through a hole in the tibial crest in a mattress fashion. These anchorages function best when placed at the caudal aspect of the lateral femoral condyle and just caudal to the extensor groove of the proximolateral tibia. Lameness may reoccur in some dogs with advancing arthritis or those in which the periarticular fibrosis is not sufficiently strong to limit abnormal thrust when the artificial ligament fails. Based on experience, I instruct clients to expect that 10% to 20% of dogs with extracapsular stabilization will require treatment or reoperation for lameness during their lifetimes, sometimes years after the original surgery. TPLO has been applied to clinical cases for over 2 decades. Its goal is to reduce cranial tibial thrust in the weight-bearing phase by “leveling” the tibial plateau. Although there are no consistently reported differences in the tibial plateau angle (TPA) of healthy dogs and those that rupture their CCLs, correction of the preexisting TPA acts to biomechanically stabilize the stifle. A medial approach to the proximal tibia and a semicircular osteotomy of the tibial plateau is performed. 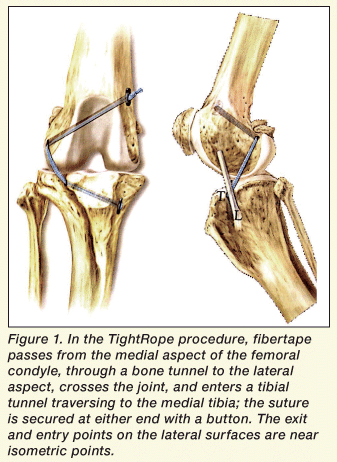 The tibial plateau is rotated based on preoperative measurements of the TPA, and the osteotomy is stabilized with a bone plate and screws (Figure 2). The incision is closed in standard fashion. A prophylactic caudal medial meniscal release procedure. Some surgeons do not use an intra-articular approach or meniscal release procedure at all. Unlike the TightRope and TTA procedures, TPLO can be performed in dogs with TPAs over 30 degrees, and in dogs with angular and torsional limb deformities. In dogs with complex tibial deformities or exaggerated TPAs, TPLO may be combined with tibial wedge osteotomy. TTA seeks to eliminate cranial tibial thrust by positioning the patellar tendon perpendicular to the shear forces in the stifle and tibial plateau, resulting in the same relative redirection of vector force as the TPLO. 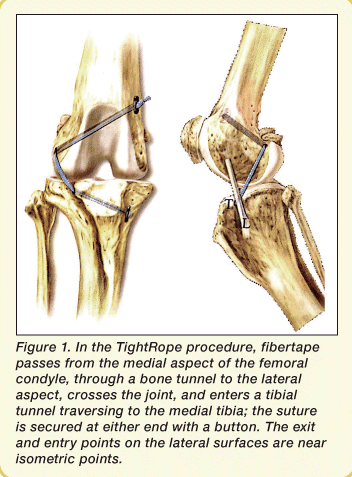 The procedure is accomplished through a surgical approach to the craniomedial aspect of the tibial crest. An osteotomy of the tibial crest is performed from just cranial to the tendon of origin of the long digital extensor muscle to the distal extent of the tibial crest. A spacer, appropriately sized according to preoperative measurements, is used to move the tibial crest cranially, and a TTA plate and “fork” are applied to stabilize the crest. 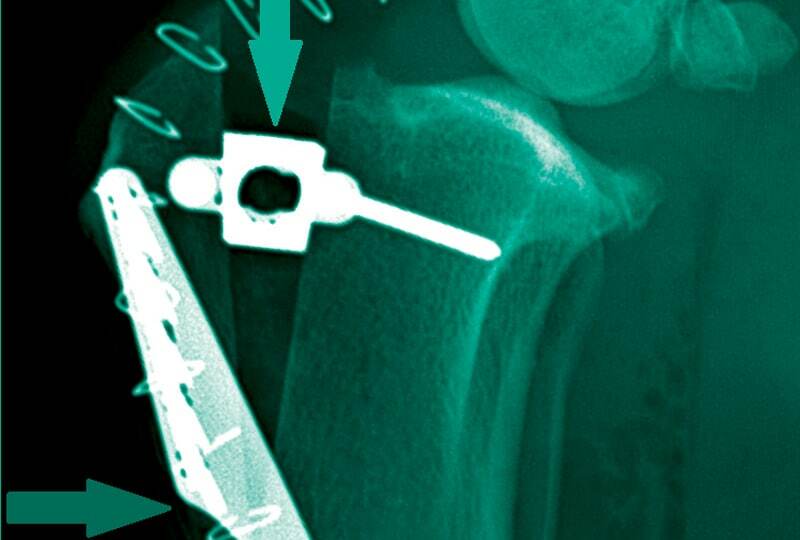 A “cage” is placed into the osteotomy site and secured with a bone screw; a bone graft is placed into the osteotomy site before closure (Figure 3). TTA does provide theoretical relief of patellar ligament tension, whereas TPLO may increase it; therefore, the occasional patellar ligament desmitis seen after TPLO is not common after TTA. These all require extensive preoperative planning, are exacting in surgical technique, and none result in better functional outcomes than TPLO or TTA at present. Arthroscopic surgery is often requested by small animal clients who are familiar with its widespread use in human medicine, but functional benefits to its use in surgery of the canine stifle have yet to be demonstrated. Compared to open arthrotomy, arthroscopy has been demonstrated to result in reduced short-term postoperative morbidity in dogs with CrCLR disease when combined with an extracapsular stabilization,21 but long-term benefits have not been investigated. As stated previously, no definitive comparison has been published comparing dogs that have undergone open arthrotomies and joint debridement, arthroscopic debridement, limited caudal meniscal release, or no arthrotomy or debridement at all. Use of arthroscopic equipment often increases surgical procedure time and cost to the client. Arthroscopic techniques that replace the canine CrCLR with patellar tendon or synthetic implants have been described and clinically applied, but large clinical studies of outcome measures are presently lacking. Injuries can be addressed directly through arthrotomy or arthroscopy, or by combination of a blind meniscal release along with TPLO or TTA. Historically, full or partial meniscectomy that includes portions of dislodged or torn menisci has been recommended, particularly because meniscal suturing techniques are difficult in dogs due to size. Since the development of TPLO, caudal meniscal release has been advocated for dislodged or damaged menisci. However, treatment of most meniscal injuries, particularly those in the aneural, avascular cartilage regions, has not been proven to result in better long-term outcomes in dogs. Partial or full meniscectomies are always detrimental to long-term joint function and may be more detrimental than the original meniscal injuries with regard to accelerating secondary OA in the knee. Although arthroscopy coupled with use of a probe has the highest sensitivity and specificity for diagnosis of meniscal injuries,23 meniscal release may not be necessary and may be detrimental to recovery. Unless specifically indicated by a meniscal “click” on physical examination, I prefer to avoid arthrotomy and do not address potential minor meniscal trauma. Physical rehabilitation may be useful to improve or speed functional recovery in postoperative patients, particularly dogs that remain persistently lame. After TPLO, loss of motion greater than 10 degrees occurs in 21.8% of dogs, and dogs with decreased range of motion are more likely to exhibit lameness.27 In 1 study of dogs after extracapsular stabilization, 6 months postoperatively, dogs that had a prescribed postoperative rehabilitation program bore more weight on the affected limb than dogs in an exercise-restricted group.28 Physical rehabilitation in the treated group consisted of walking (10 min) and swimming (10 min) twice daily during weeks 3, 5, and 7 after surgery. Nutraceuticals have not been proven effective as an adjunctive therapy during recovery of TPLO. There are few published anecdotal reports, but no controlled clinical trials, that support the efficacy of alternative therapies, such as laser, stem cell, or chiropractic therapy for treatment of CrCLR. These treatments should not be recommended at this time for this purpose. The common course of clinical signs in an untreated dog with CrCLR is obvious lameness after rupture; then improved or mild lameness for a period of 6 to 12 weeks, followed by gradually increasing lameness as secondary OA develops in the stifle. The improvement after initial lameness is often misinterpreted as evidence for efficacy of alternative therapies, when, in fact, it is the natural progression of the disease. Likewise, claims for postoperative rehabilitation efficacy of various modalities, such as laser therapy and shock-wave therapy, may also be confused with the natural course of postoperative improvement. Lack of a meniscal “click” on palpation. Applies to a broader range of patients, including those with TPAs over 30 degrees, or with angular or torsional limb deformities. Regardless of the technique chosen, extracapsular stabilization techniques or tibial osteotomies should result in 85% to 95% improvement after surgery. No current technique will result in return to normal weight bearing in all dogs, but each technique has been proven to improve lameness and patient comfort for long periods of follow-up in most dogs, and to result in high client satisfaction. No current technique completely halts OA progression. Conzemius MG, Evans RB, Besancon MF, et al. Effect of surgical technique on limb function after surgery for rupture of the cranial cruciate ligament in dogs. JAVMA 2005; 226:232-236. Dupuis J, Harari J, Papageorges M, et al. Evaluation of fibular head transposition for repair of experimental cranial cruciate ligament injury in dogs. Vet Surg 1994; 23:1-12. Christopher SA, Beetem J, Cook JL. Comparison of long-term outcomes associated with three surgical techniques for treatment of cranial cruciate ligament disease in dogs. Vet Surg 2013; 42:329-334. Duerr FM, Martin KW, Palmer RH, Selmic LE. Treating cranial cruciate ligament disease: Preliminary data from a survey of ACVS Diplomates. Vet Surg 2013; 42:E89. Kowaleski MP, Boudrieau RJ, Pozzi A. Stifle joint. In Tobias KM, Johnston SA (eds): Veterinary Surgery Small Animal, Vol I. Philadelphia: Elsevier Saunders, 2012, pp 906-998. Cook JL, Luther JK, Beetem J, et al. Clinical comparison of a novel extracapsular stabilization procedure and tibial plateau leveling osteotomy for treatment of cranial cruciate ligament deficiency in dogs. Vet Surg 2010; 39:315-323. Raske M, Hulse D. SwiveLock bone anchor stabilization of the cranial cruciate ligament deficient stifle in dogs: Clinical outcome. Open J Vet Med 2013: 3:297-301. Au K, Gordon-Evans WJ, Dunning D, et al. Comparison of short- and long-term function and radiographic osteoarthrosis in dogs after postoperative physical rehabilitation and tibial plateau leveling osteotomy or lateral fabellar suture stabilization. Vet Surg 2010; 39:173-180. Nelson SA, Krotscheck U, Rawlinson J, et al. Long-term functional outcome of tibial plateau leveling osteotomy versus extracapsular repair in a heterogeneous population of dogs. Vet Surg 2013; 42:38-50. Lazar TP, Berry CR, DeHaan JJ, et al. Long-term radiographic comparison of tibial plateau leveling osteotomy versus extracapsular stabilization of cranial cruciate ligament rupture in the dog. Vet Surg 2005; 34:113-141. Gordon-Evans WJ, Griffon DJ, Bubb C, et al. Comparison of lateral fabellar suture and tibial plateau leveling osteotomy techniques for treatment of dogs with cranial cruciate ligament disease. JAVMA 2013; 243:675-680. Choate CJ, Lewis DD, Conrad BP, et al. Assessment of the craniocaudal stability of four extracapsular stabilization techniques during two cyclic loading protocols: A cadaver study. Vet Surg 2013; 42:853-859. Cook JL. Proceedings 3rd World Veterinary Orthopaedic Congress 2010; p 93. Ballagas AJ, Montgomery RD, Henderson RA, Gilette R. Pre- and postoperative force plate analysis of dogs with experimentally transected cranial cruciate ligaments treated using tibial plateau leveling osteotomy. Vet Surg 2004; 33:187-190.
de Medeiros M, Sanchez Bustinduy M, Radke H, et al. Early kinematic outcome after treatment of cranial cruciate ligament rupture by tibial plateau leveling osteotomy in the dog. Vet Comp Orthop Trauma 2011; 24:178-184.
http://www.fluokin.de/projekte/kbr/index.html; referenced February 18, 2014. Fitzpatrick N, Solano MA. Predictive variables for complications after TPLO with stifle inspection by arthrotomy in 1000 consecutive dogs. Vet Surg 2010; 39:460-472. Voss K, Damur DM, Guerrero T, et al. Force plate gait analysis to assess limb function after tibial tuberosity advancement in dogs with cranial cruciate ligament disease. Vet Comp Orthop Trauma 2008; 21:243-249. Wolf RE, Scavelli TD, Hoelzler MG, et al. Surgical and postoperative complications associated with tibial tuberosity advancement for cranial cruciate ligament rupture in dogs: 458 cases (2007-2009). JAVMA 2012; 240:1481-1487. Kim SE, Pozzi A, Kowaleski MP, Lewis DD. Tibial osteotomies for cranial cruciate ligament insufficiency in dogs. Vet Surg 2008; 37:111-125. Hoelzler MG, Millis DL, Francis DA, Weigel JP. Results of arthroscopic versus open arthrotomy for surgical management of cranial cruciate ligament deficiency in dogs. Vet Surg 2004; 33:146-153. Moseley JB, O’Malley K, Petersen NJ, et al. A controlled trial of arthroscopic surgery for osteoarthritis of the knee. New Engl J Med 2002; 347:81-88. Pozzi A, Hildreth BE, Rajala-Schultz PJ. Comparison of arthroscopy and arthrotomy for diagnosis of medial meniscal pathology: An ex vivo study. Vet Surg 2008; 37:749-755. Austin B, Montgomery RD, Wright J, et al. Evaluation of three approaches to meniscal release. Vet Comp Orthop Trauma 2007; 20:92-97. Thieman KM, Tomlinson JL, Fox DB, et al. Effect of meniscal release on rate of subsequent meniscal tears and owner-assessed outcome in dogs with cruciate disease treated with tibial plateau leveling osteotomy. Vet Surg 2006; 35:705-710. Roush JK, Cross AR, Renberg WC, et al. Evaluation of the effects of dietary supplementation with fish oil omega 3 fatty acids on weight bearing in dogs with osteoarthritis. JAVMA 2010; 236:67-73. Jandi AS, Schulman AJ. Incidence of motion loss of the stifle joint in dogs with naturally occurring cranial cruciate ligament rupture surgically treated with Tibial Plateau Leveling Osteotomy: Longitudinal clinical study of 412 cases. Vet Surg 2007; 36:114-121. Marsolais GS, Dvorak G, Conzemius MG. Effects of postoperative rehabilitation on limb function after cranial cruciate ligament repair in dogs. JAVMA 2002; 220:1325-1330. Gordon-Evans WJ, Dunning D, Johnson AL, Knap KE. Effect of the use of carprofen in dogs undergoing intensive rehabilitation after lateral fabellar suture stabilization. JAVMA 2011; 239:75-80. Gordon-Evans WJ, Dunning D, Johnson AL, Knap KE. Randomized controlled clinical trial for the use of deracoxib during intense rehabilitation exercises after tibial plateau leveling osteotomy. Vet Comp Orthop Trauma 2010; 24:332-335. Gallagher A, Cross AR, Sepulveda G. The effect of shock wave therapy on patellar ligament desmitis after tibial plateau leveling osteotomy. Vet Surg 2012; 41:482-485. 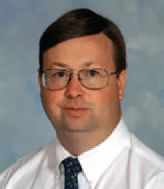 James K. Roush, DVM, MS, Diplomate ACVS, is the Doughman Professor of Surgery at Kansas State University College of Veterinary Medicine. 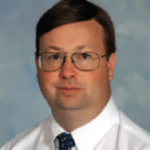 He obtained his DVM from Purdue University and completed a small animal surgical residency and MS degree at University of Wisconsin–Madison.